Is geoSystem paving grid durable? 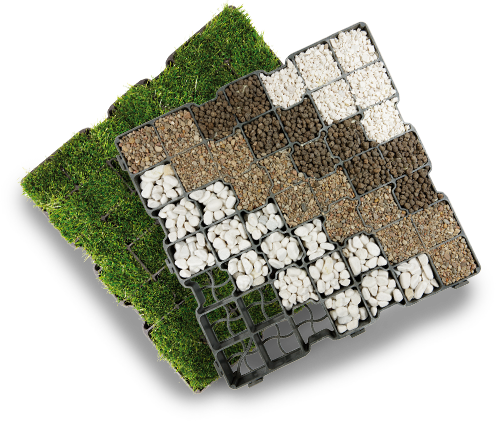 GeoSYSTEM grass protection grid is made of recycled plastic compound, which makes it very elastic and hardly breakable. Special interlocking system guarantees continous and firm surface. Is geoSystem Reinforcement visible in the ground? GeoSystem Reinforcement grid is black, therefore completely invisible once put into the ground unlike the green grids, which have different shade than grass and are always easily noticeable. What is the function of the openings in geoSYSTEM Reinforcement grid? Irregular shape of the opennings in geoSYSTEM grids allows the surface to „breathe” when the temperature fluctuate. Where you can use geoSYSTEM paving grids? GeoSYSTEM car park grid can be used everywhere, whether it is a huge investment or a private garden, it will work perfectly. The exact applications for each of geoSYSTEM grids can be found here. Is the surface covered with geoSYSTEM grids considered biologically active? The percentage of surface which is considered biologically active is reliant on the amount of compund in a square meter of grid's surface. Due to the fact that the surface is partialy covered with the plastic construction of the grid it can not be considered biologically active in full. Let's take the geoSYSTEM G4 grid as an example. 15% of its total surface consists of recycled plastic, meaning that the remaining 85% can be accounted for biologically active. Is it neccessary to create a substructure for geoSYSTEM grids? Yes, proper site preparation is the key to a successful installation. The substructure guarantees the surface is stable and weight resistant. Once the substructare is appropriately tamped and leveled you can be assured that the surface will resist deformation and dislocation under truck load. What substructre will work best with geoSYSTEM paving grids? The substructure should be matched in realtion to geological conditions in a given area. It should be evaluated by an engineer and specified in the construction design. Can geoSYSTEM grids be pruned? Yes, it is neccessary when you want to make curves or match the dimensions. What tools can be used to cut the geoSYSTEM grids? They can be pruned with an angle grinder, blade or even garden shears. Can geoSYSTEM grids be shoveled? GeoSYSTEM paving grids can be cleared of snow with the use of snow shovel, but it should be held a few milimeters above to surface not to damage the grass or scatter the chipping. If the grids were used to reinforce the car parks or driveways and are filled with gravel there is no need to shovel them as the cars will push the snow in between the gravel. Why not to buy the concrete reinforcement grids? It limits the amount of square meters of biologically active surface, which have great positive impact on our environment. Every green area or even a simple object serve a great purpose for city's air. GeoSYSTEM paving grids can increase the amout of green areas in the city, limit the air pollution, absorb acoustic waves and manage water control. How to maintain grass in a geoSYSTEM grid? The best way to maintain grass is to use HORTNAS fertilizer. It contains an increased amount of phosphorus, therefore it helps the grass spread and positevely influences the expansion of roots. The large amount of potassium improve the winter hardiness of plants as well as their resiliance to fungal diseases. Go to online shop and place an order or download our catalog to get familiar with our offer. Contact us and get an offer tailored to your needs.